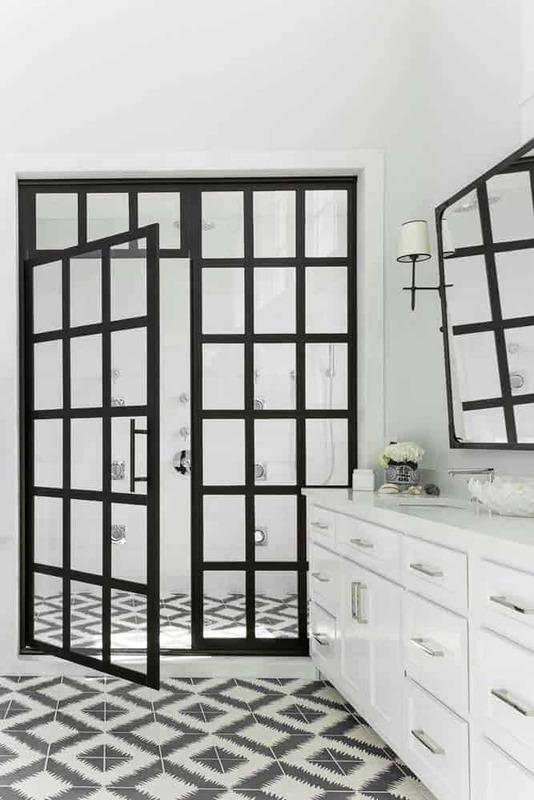 No matter what you call them, they certainly bring a high-end look to a bathroom. 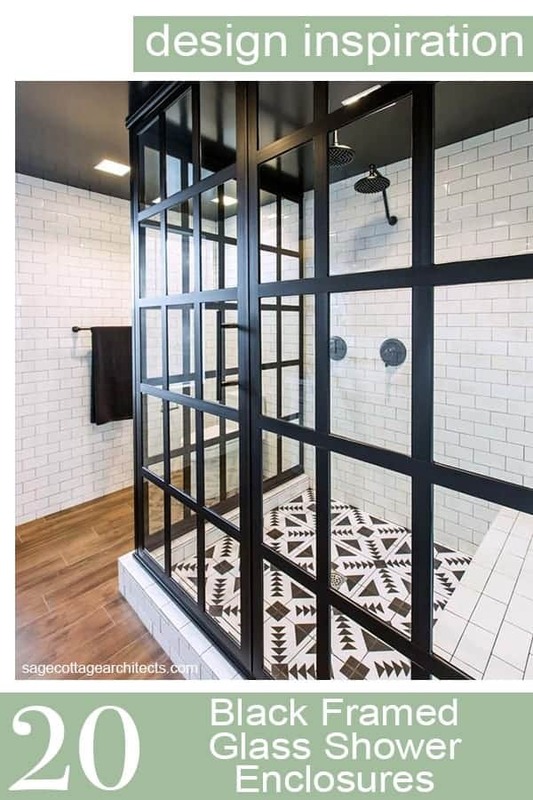 While it has both an industrial and modern feel, this style of glass shower enclosure also works well when combined with a farmhouse style bathroom. They are definitely a great idea for a bathroom remodel. Semi-freestanding – the black framed glass forms two or three walls of the shower and connects to a tiled wall (top photo). A traditional walk-in shower with three tiled walls and black framed glass doors (above photo). 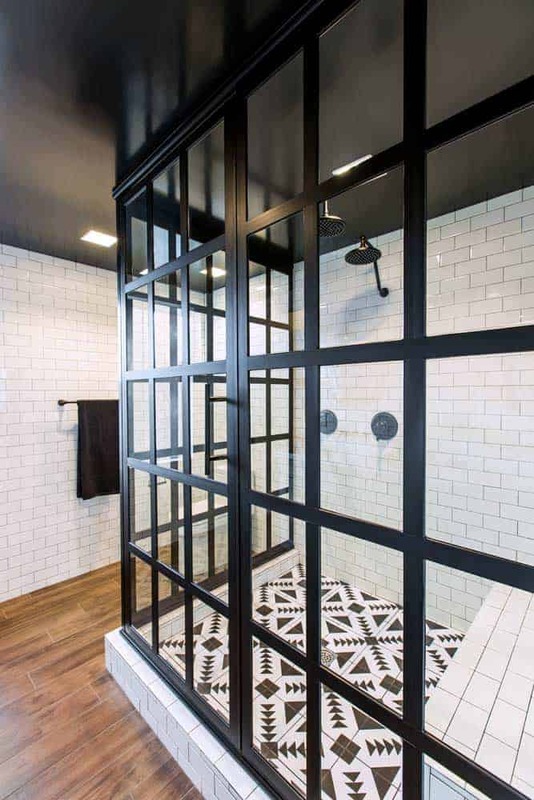 A shower screen – the black framed glass panel creates a walk-in, curbless shower. It only covers a portion of the side of the shower area, and is connected to the floor (below). These are perfect for adding handicap accessibility to a bathroom. The glass, like all shower enclosures, is tempered, meaning the glass will break into smaller pieces rather than big shards. The mullions (the black bars that make the grid) are usually about 1″ wide. Enclosure system frames and mullions can be made from anodized aluminum or steel. Doors come in several styles: a traditional swing door, a sliding door, a French door (double doors), or a sliding barn door with rollers. I did a little research and found two nationally available manufacturers: Coastal Shower Doors and Dreamline. They take different approaches to these kind of enclosures. 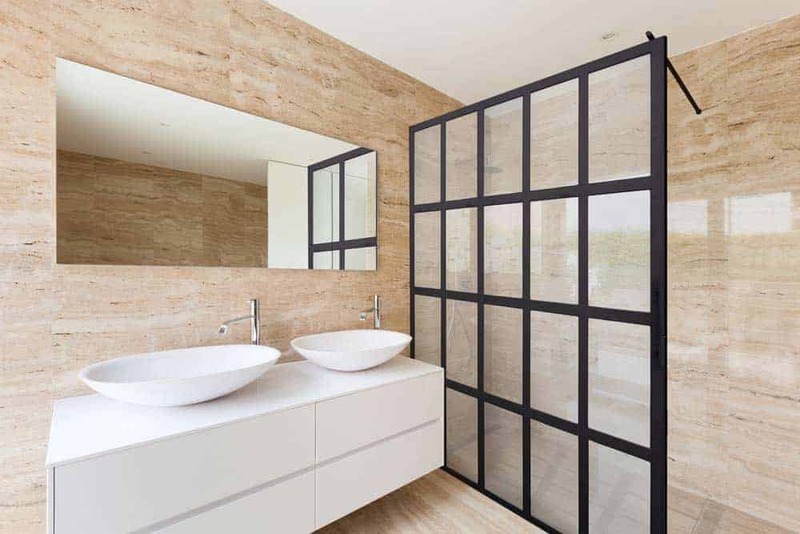 Coastal Shower Doors’ Gridscapes is a completely customizable system, made with a rust-proof, anodized aluminum frame. They offer two options: full divided light, which has the mullions only on the outside of the shower, and true divided light, which has individual panes of glass with mullions on both sides. With the Gridscapes system, you can customize the panel layout, panel size, and door type. You can also customize the mullion pattern, mullion colors, and the type of glass. Dreamline’s products are off-the-shelf products instead of custom. These are also made from anodized aluminum, but rather than a metal mullion system, Dreamline uses a durable paint on the glass to achieve the mullion look. They currently only offer one black frame enclosure, the French Corner. It has two sides of glazing, and a 34.5″ x 34.5″ base. It would be great in a smaller bathroom. They also have a line of black frame sliding shower doors, Unidoor Toulon, in various sizes. Finally, they have fixed screen options with their French Linea Toulon line. So, this is probably the biggest question everyone has about these glass shower enclosures. The simple answer is that it depends on what you buy. Both Dreamline products and Coastal Shower Door’s full divided light are just as easy to clean as any glass shower enclosure. But, Coastal’s true divided light would take more work to keep clean since it has mullions on the inside. No matter which you chose, you’re still going to be using that squeegee. I love putting together these Houzz Ideabooks. They really get the creative juices flowing. I hope you found some inspiration – I know I did! Add this to your Pinterest boards! Now I know what I want to replace my 1973 Harvest Gold fiberglass tub/shower with. The black framed glass shower enclosures look oriental to me. Love shoji screens. I didn’t see that, but you’re right! Let’s do it!